The saying “fighting like cats and dogs” is in our vocabulary for a reason. These two species have very different personalities. If comparing them to people, you might say that cats are introverts while dogs are extroverts. 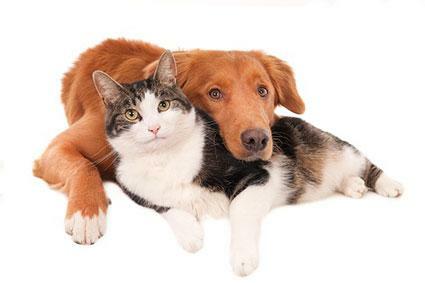 However, these differences do not mean that cats and dogs can’t live together under the same roof. In fact, they might even grow to become close companions. The best way to socialize cats and dogs is to raise them together from the puppy and kitten stage. Younger animals are easier to train and less likely to be stuck in their ways. If cats and dogs learn to be friendly around each other from the start, the behavior will seem like second nature as they get older. Of course, this might not always be an option, especially if you adopt an older dog or cat. Consider bringing in an obedience trainer to help with socialization if needed. Cats and dogs are territorial, and each needs a place they can call their own before they feel comfortable engaging with each other. This means keeping your dog out of the litter box and your cat away from your dog’s bed. Cats love to climb, so consider giving them a perch above the fray in the rest of your house, especially if you have more than one dog running around. Most dogs like to be outside, which means an outdoor space might be a better fit for them. If space in your home is limited, consider putting up baby gates (at least temporarily) as a way to keep dogs and cats apart when problems arise. Over time, you might find that you no longer need the gates as each carves out its own place. If you can’t commit to regular exercise for your dog, consider hiring a dog walking service like 4 Your Spot. We’ll ensure that your dog receives the exercise and companionship it needs to thrive. We can also check in on your cats daily to make sure they are receiving the attention they need to avoid becoming antisocial. This balance is key to ensuring that the cats and dogs in your home don’t resort to fighting like cats and dogs!